If you've been following my blog for a while - since the end of 2015-beginning of 2016 - you'll probably remember a post I did last year about the Thousand Smiling Faces project (I also wrote another post about it immediately after). 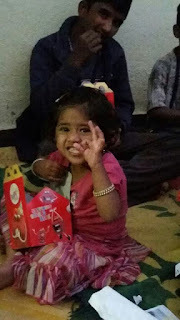 For those of you who are too lazy to click through those links, the Thousand Smiling Faces project was a bunch of us teenagers getting McDonald's Happy Meals for 1000 kids in orphanages. I was planning to this again on New Year's Day 2017, but couldn't get it to work out. However, Independence Day is coming up, and we're going to do it again, but this time, we've gone a little crazy - instead of working with 1000 kids, we're aiming to deliver 5000 meals! That's roughly ₹5,00,000's worth of Happy Meals, a lot of burgers by anyone's standards. We've also got another twist to the thing this year. Seeing as we're doing it on the 15th of August, which is India's Independence Day, and seeing as how McDonald's is just a faceless multinational corporation, we're going to ask every orphanage we visit to raise the Indian flag. 5000 meals means that we're going to have around 50 orphanages, so I'm currently working really hard to get some volunteers. There will have to be at least 50 of us if we want to be able to get pictures at all the orphanages, and so far I have a grand total of 6 people - including myself - signed up. The five of us - Impana Halgeri, Anirudh Iyengar, Arnav Poddar, Jayitha VSS and I - are calling the orphanages and getting this project started. If you're under the age of 18 (Sorry, adult readers) and want to volunteer, you can sign up here. The other big way in which you can help is by donating to the event. We've set up a page with Milaap.org, the fundraising platform we used last year. Please give generously, because ₹5,00,000 is not a small sum. We will get burgers for the kids using however much money we manage to raise, irrespective of the ₹5,00,000 goal, but it'd still be amazing to feed 5000 kids, even if it's only for one meal. To use a (slightly modified) cheesy advertising tagline from last year - This Independence Day, let's put a smile on 5000 faces!